See Demographics section for population frae R.M. o Wood Buffalo's 2010 municipal census. 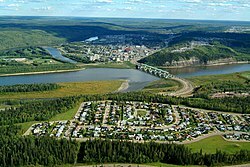 Fort McMurray, ance named McMurray, is an urban service aurie in the Regional Municipality (R.M.) o Wood Buffalo in Alberta, Canadae. ↑ 2.0 2.1 "Census Profile - Fort McMurray, Alberta (Population Centre)". Statistics Canada. 2012-02-08. Retrieved 2012-02-08. ↑ "2010 Municipal Codes" (PDF). Alberta Municipal Affairs. 2010-04-01. Retrieved 2010-07-19. ↑ "Specialized and Rural Municipalities and Their Communities" (PDF). Alberta Municipal Affairs. 2010-04-01. Archived frae the oreeginal (PDF) on 2011-07-06. Retrieved 2010-07-10. This page wis last eeditit on 11 Mairch 2018, at 09:36.